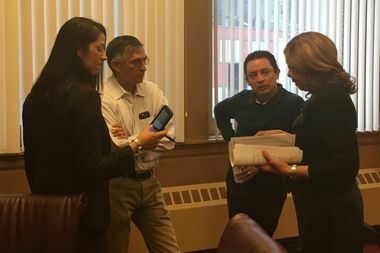 Aldermen Ray Lopez, second from right, and Ricardo Munoz, second from left, speak with Deputy Mayor Andrea Zopp, right, and chief lobbyist Maria Guerra Lapace, left, about the plan for $16.2 million left over from the property tax rebate program. CITY HALL — Mayor Rahm Emanuel's plan for money left unclaimed by the city's property tax rebate effort ran into a buzz saw of opposition Tuesday morning from aldermen who want the $16.2 million to be used to fight violent crime in Chicago neighborhoods. The City Council's Finance Committee postponed a vote on Emanuel's plan to spend the money on a host of projects and programs, including new trees, parks and after-school programs in the face of unyielding opposition led by 15th Ward Ald. Ray Lopez, who wants the money used to keep teens and young adults off the street and for violence prevention programs. The committee will meet again Wednesday morning before the scheduled meeting of the full Council, in 34th Ward Ald. Carrie Austin's attempt to forge a compromise. "This money would be better spent on violence prevention than on trees," Austin said. Negotiations were expected to continue Tuesday afternoon behind closed doors at City Hall. However, 12th Ward Ald. George Cardenas, chairman of the Latino Caucus, said the members of his caucus would vote "no" unless Emanuel revises his plan to grapple "mano and mano" with the violence in the city's neighborhoods. There is no point in improving Chicago's parks and sidewalks if children are not safe walking down the street or playing in Chicago's parks, Cardenas said. "We want long-term solutions to the problems of violence," Cardenas said. "Let's tackle the problem right in front of us, which is violence." Molly Poppe, a spokeswoman for the mayor, has said Emanuel favors a "holistic approach" that tackled violence by "investing in communities." The Council already has approved using $1.3 million of the leftover money to create a legal defense fund for immigrants threatened with deportation by the Trump administration. The mayor's proposal came off like a "cruel joke" to people suffering in his ward, Lopez said. Lopez's plan, supported by a dozen aldermen, would use $7 million to expand the city's summer jobs program to year-round; earmark $5 million for counseling for teens and young adults; and use $5 million to expand the city's mentoring programs to fifth- and sixth-graders. Aldermen Pat Dowell (3rd), David Moore (17th) Greg Mitchell (7th) and Michael Scott (24th) said $5 million should be used to fund CeaseFire, a violence suppression program that saw its funding cut by Republican Gov. Bruce Rauner.